Generally, stainless steel 304L can not be used in applications involving nitric acid since it may experience significant uniform or intergranular attack. Grade 2 titanium is applicable for handling and producing nitric acid. It shows excellent resistance to HNO3 attack at subboiling temperature. 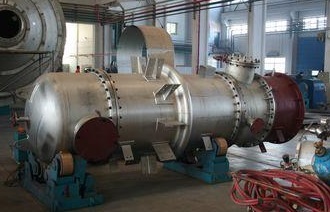 A stripper reboiler made of grade 2 titanium for nitric acid recirculating process. At boiling temperature, grade 2 titanium may exhibit accelerated corrosion in nitric acid. However, this corrosion is highly dependent on nitric acid purity. Further titanium corrosion is inhibited by its own corrosion products (titanium ion, Ti4+). This inhibitive effect results in improved corrosion resistance of grade 2 titanium to concentrated nitric acid at elevated temperatures. The comparison of corrosion resistance to 90% boiling nitric acid between titanium Gr.2 and stainless steel 314L are presented below. *The nitric acid shall be stagnant during tests. The corrosion data is measured from heating surfaces exposed to boiling HNO3.